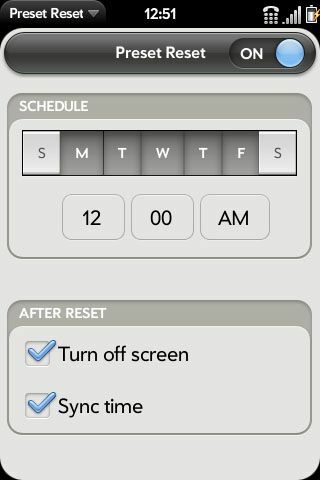 Schedules device resets with added option for time sync. As you can see from the screenshot, you get to specify which days of the week you want the reset to occur. Then of course, you specify what time you want the reset. I've added post-reset options as well, like turning the screen off, and time syncing. In the app's menu, I've included a time sync button if you want to sync for yourself. 1 minute before reset time, a notification area popup will appear counting down the 60 seconds. There's also 2 button: one that will delay countdown 10 additional minutes and one that will cancel that day's reset. 5 minutes after the reset starts (I figured that's be enough time for a reset to full complete), the post-reset actions will happen.